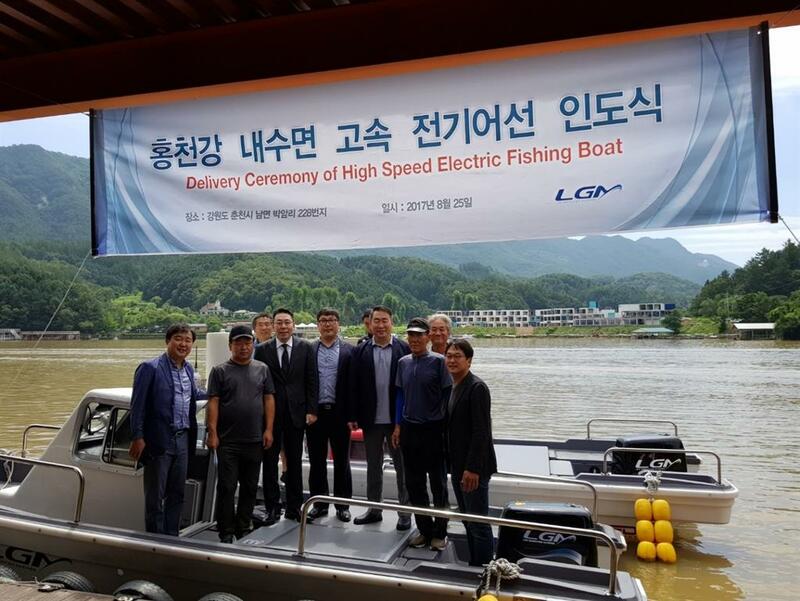 SEOUL, SOUTH KOREA / ACCESSWIRE / August 28, 2017 / LGM, a subsidiary of Leo Motors Inc. (OTCQB: LEOM) delivered the first high-speed electric fishing boat to the Korean government in a ceremony at Lufi Harbor on Hongcheon River of Chuncheon City, South Korea last Friday. The government transferred the high-speed electric fishing boat to Mr. S. K. Ban, secretary general of the Association of Fishermen Union. Mr. Ban will deploy the high-speed e-fishing boat for river fishing, testing the power, safety, dependability, and utility while assessing for further improvements. He will then promote sales of the electric boat (e-boat) to the Korean fishing communities. Appointed as the sole partner of Korea's electric boat program, LGM has developed the high-speed electric boat with the aid of a government subsidy. The boat passed all required testing for certification from the Korean government. This electric boat operates at speeds faster than its internal combustion engine (ICE) counterparts. The sailing range of LGM's e-boat is longer than ICE fishing boat as LGM uses its patented cartridge battery system which enables the sailor to freely extend the range of the e-boat. Before selling this boat, after conduction tests for the past four years, LGM developed two high-speed electric fishing boats. During the test period, LGM solved many problems, innovating technologies such as battery exchange, electricity shock prevention, range management, power management, and mobile connection. The Korean government subsidy program for conversion of electric boats is intended to deploy more electric fishing boats to resolve problems caused by the former tax-free gas program for fishermen. The tax-free gas costs about half of regular gas, meaning Korean fishermen could formerly fish at lower costs than competing countries. Thus, WTO and TPP warned the Korean government to cease providing said tax-free gas. Doing so results in a sharp increase in operational costs for the fishermen which may preclude many individual fishermen from fishing at all. Using electric boats, the fuel costs will be substantially lower than using tax-free gas, therefore improving the operational costs drastically and opening new possibilities for the fishing industry. Due to concerns such as charging methods, driving range, and overall performance, the fishermen have been reluctant to integrate an electric power system to their boats. As a solution, the government decided to develop and showcase a working electric boat, and through the bidding process. LGM was appointed as project owner for a demonstration of sustainable technology that answers said concerns. Electric boats have more advantages other than energy efficiency. Electric boats substantially reduce noise while traveling, an inherent problem for ICE boats and do not produce any stench and pollutive gas from oil or gas. Despite these advantages, only a handful of electric boats have been developed throughout the world due to high technology barriers. Electric boat power systems have traditionally presented electric shock hazards because of the proximity of water. Thus, users of e-boats are exposed to the potential of fatal electric shock accidents. LGM's innovative technologies eliminate such dangers and this innovation enables LGM to be the first company in the world to offer water-friendly electric boats. Dr. Kang, chairman of Leo Motors, said, "There are many companies in the world who market electric cars but only a few companies can make electric boats. The major reason for this is that there is a big entry barrier in overcoming electric safety issue. Thus, some companies and individuals developed high power electric boats, but they were not able to make them marketable electric boats because of electric shock problems. Due to this, LGM is the only company in the world which can manufacture high power electric propellant system which makes more than 40 horse powers without electric safety risks." Another important technology used in Leo's e-boat is the Cartridge Battery (CB) System. E-boats must recharge the batteries every day. But, it is almost impossible to facilitate a battery charging station in the fishing harbor. For e-fishing boats, battery swap is the only solution. LGM invented the patented battery replacement system which relieves toxic charging environments. Swapping a battery, the whole power pack weighing more than 1,400 lbs. is not an easy task and requires an extravagant facility. To overcome this dilemma, Leo developed the CB (Cartridge Battery) technology. CB which splits the battery into smaller, lightweight cartridges optimized for easier handling. When CB works in harmony with LGM's newly innovated Battery Swapping Machines, it debunks the time required to fuel vehicles of equivalent size with gas. Connected boat technology is another technical breakthrough. Leo AIC, another subsidiary of Leo Motors, developed the hyper connected artificial intelligence (AI) platform for e-boats which is networked and connected with an AI solution in the cloud computer. They are ready to function under the command of AI. LGM's AI-connected positioning application is based on digital GPS which uses both Satellite and Mobile Network. LGM is also developing a unique Geo Fence Based Ranging System to analyze sailing status with real time for optimal autonomous sailing. The Diagnosis Applications provide real time connected maintenance and service for all LGM boats. From battery charge rate to replacement of components and accessories, and boat failure probability, it enhances safe and comfortable sailing experience. LGM has already developed powerful Communication Applications. Leo's power supply system is CAN (Controller Area Network) based, which enables Mobile Diagnosing between mobile devices and Leo's boats. Auto Pilot Applications make autonomous sailing possible. Leo is expanding its e-boat businesses into both China and the USA. In China, Leo will be forming a joint venture company for the production of e-boats. In 2015, the Chinese government announced that they will not allow ICE boats in inland water such as reservoirs, lakes, or rivers which exist as valuable sources for drinking water or as important tourism destinations. In the USA, Leo looks to start an electric power yacht business this year. The e-yacht businesses will supply electric propellant systems for up to 60 feet sailing yachts, using Leo's 660 horse power (500kW) electric power system. Using LGM's electric propellant systems, yacht owners will be able to enjoy the premium yachting experience, free from both odors and noise.